European visible astronomy satellite. Scientific satellite for astrometry. Didn't reach GEO due to AKM failure; measured star positions. Frequency plan 2054.25 /2241 MHz. Launch time 2325:53 UT. Designator ESA/89/03. Astrometry satellite built by Matra Marconi Space (satellite prime, payload), Alenia Spazio (co-prime: spacecraft procurement) for ESA, Europe. Launched 1989. Status: Operational 1989. First Launch: 1989-08-08. Last Launch: 1989-08-08. Number: 1 . Gross mass: 1,130 kg (2,490 lb). 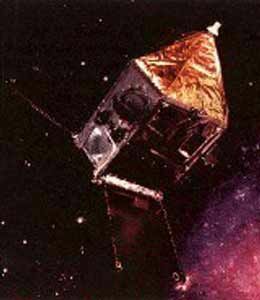 The scientific goals of this mission were the accurate measurement of the trigonometric parallaxes, proper motions, and positions of 100,000 selected stars, mostly fainter than 10th magnitude. The spacecraft consisted of two platforms and six vertical panels, all made of aluminum honeycomb. The solar array consisted of three deployable sections. Antennas were located on the top and bottom of the spacecraft. An attitude and orbit-control subsystem ensured correct dynamic attitude control and determination during the 2.5 year planned lifetime. The spacecraft spun around its Z-axis at the rate of 12 rev/day at an angle of 43 degrees to the sun. The Z-axis rotated about the sun-satellite line at 6.4 rev/year. The spacecraft carried a single telescope which, in the focal plane, superimposed two fields of view 58 degrees apart. The attitude of the spacecraft about its center of gravity was controlled to scan the celestial sphere in a regular movement. The telescope used a system of grids, at the focal surface, composed of alternate opaque and transparent bands. Behind these grids, an image-dissector tube converted the modulated light into a sequence of photon counts from which the phase of the entire pulse train from a star could be derived. The apparent angle between two stars in the combined fields of view was obtained from the phase difference of the two star pulse trains. The telescope was an all-reflective eccentric Schmidt system. A complex mirror was employed which consisted of two mirrors tilted in opposite directions, each occupying half of the rectangular entrance pupil. The unvignetted field of view was 94 arc-min by 54 arc-min. An additional photomultiplier system, known as Tycho, viewed a beam splitter in the optical path and was used to gather photometric and astrometric data of 400,000 stars down to 11th magnitude. Measurements were made in two broad bands corresponding to B and V in the Johnson BUV system. The positions of these latter stars were to be determined to a precision of 0.05 arc-s, which is a factor of 25 less than the main mission stars. The mission was a facility type in which guest investigators propose particular research programs, and selected stars were incorporated into the overall observing strategy. Family: Astronomy, Geosynchronous orbit, Visible astronomy satellite. Country: Europe. Engines: Mage 2. Launch Vehicles: Ariane, Ariane 44LP. Launch Sites: Kourou, Kourou ELA2. Agency: ESA. Bibliography: 2, 279, 6. Hipparcos - . Mass: 1,130 kg (2,490 lb). Nation: Europe. Agency: ESA. Class: Astronomy. Type: X-ray astronomy satellite. Spacecraft: Hipparcos. USAF Sat Cat: 20169 . COSPAR: 1989-062B. Apogee: 35,836 km (22,267 mi). Perigee: 542 km (336 mi). Inclination: 6.70 deg. Period: 638.70 min. Didn't reach GEO due to AKM failure; measured star positions. Scientific satellite for astrometry. Frequency plan 2054.25 /2241 MHz. Launch time 2325:53 UT. Designator ESA/89/03. .